Kale is a true powerhouse of the leafy green vegetable group. If you have seen it or even better, eaten it, you’ll know it’s a dark green, thick, and dense leaf. It hangs out in the produce section with the lettuce, but it is actually a part of the cabbage family, along with broccoli, brussel sprouts, and collard greens. This group of veggies is touted not only for it immense nutrient value, but cancer-fighting abilities, antioxidants, and anti-inflammatory properties. There are several varieties, which differ slightly in look, texture, and taste and it can be tossed into a bunch of different recipes to substantially increase the total nutrient value of your meal. In just a 100 calories of kale, there is 25-35% of the National Academy of Sciences' public health recommendation of the omega-3 fatty acid (alpha-linolenic acid, or ALA). Kale is also a spectacular source of vitamin K, which is another key nutrient in helping to simmer down our body's inflammatory process. The dark green color is a giveaway that kale is chocked full of good stuff. 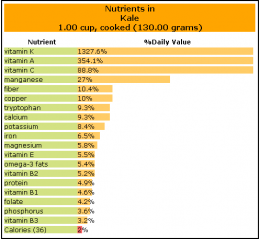 The Caratonoids beta-carotene and Lutein lead the way, with vitamin K, vitamin C, Zeaxanthin. It’s also reasonably rich in calcium. Boiling does seep out much of the nutrients so steaming, microwaving, broiling, or stir-frying reduces significant nutrient loss. Kale Chips: tear leaves apart, sprinkle on some olive oil, pepper, a pinch of salt, and broil for 4 min or so. In Shakes: tear off a few strands and chuck them in your morning shake. Trust me, you will not taste it, but your body will thank you for the added nutrients. In Salads: I like to change my leaves up and usually avoid the ever popular, nutrient deficient iceberg and romaine and lettuces. Spinach, kale, cabbage, and other wild greens are far better choices. In Soups or Stews: Add some strips of kale to a chicken stew or even your Caveman Chili. Almost all experts in the medical research field agree that the brassica group of vegetables reduces the likelihood of acquiring cancer-inflicted cells. 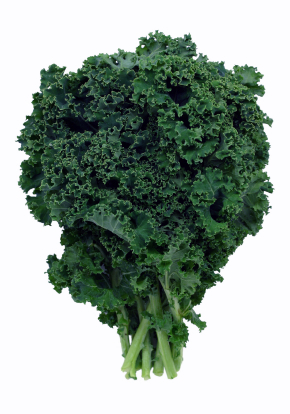 Kale’s sources are sulforaphane, with the addition of indole-3-carbinol, a chemical which boosts DNA repair in cells. Both appear to block the growth of cancer cells. It contains at least four different glucosinolates, and once kale is eaten and digested, these glucosinolates can be converted by the body into cancer preventive compounds. 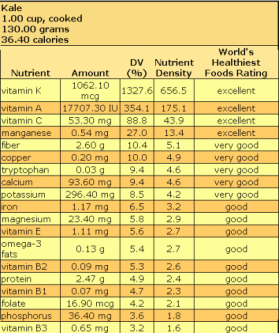 There have been over 45 different flavonoids in identify kale, with kaempferol and quercetin heading the list. These flavonoids combine both antioxidant and anti-inflammatory benefits in way that gives kale a leading dietary role with respect to avoidance of chronic inflammation and oxidative stress. Oxidative stress and chronic or systemic inflammation are the leading risk factors for development of cancer and other artery-heart-circulatory related disorders. Like broccoli, cauliflower, and collards, kale is a descendent of the wild cabbage, a plant thought to have originated in Asia Minor and to have been brought to Europe around 600 B.C. by groups of Celtic wanderers. Curly kale played an important role in early European foodways, having been a significant crop during ancient Roman times and a popular vegetable eaten by peasants in the Middle Ages. English settlers brought kale to the United States in the 17th century.